Mass illnesses among conscripts are a familiar, though less common, occurrence nowadays. This time it’s the Central MD’s 74th Independent Motorized Rifle Brigade (v/ch 21005) in Yurga, Kemerovo Oblast. What we have are assorted versions of what’s happened in Yurga. There’s backpedaling and softpedaling. The prosecutor’s only too happy to probe the army’s mistakes. There have been cuts in military medicine and reorganizations under Serdyukov that are to blame. His fondness for the expensive new uniforms by fashion designer Yudashkin are an easy target too. Yes, Russian draftees are unhealthy when they arrive, but why are they drafted then? And there’s always gross neglect by commanders who see conscripts as sub-human. And General Staff Chief Makarov just chalks it all up to the ‘slovenliness’ of the command. With all that said . . . The MD command, district medical service representatives, and military prosecutors blame ‘oversights’ in the work of the brigade’s command for an outbreak of acute upper respiratory infections (colds) that have afflicted 126 conscripts since mid-October, according to ITAR-TASS. They blame the command for poorly “organizing the daily activity of sub-units in conditions of severe frost going as low as minus 40 degrees (-40 F).” They also cite the lack of timely preventative measures. This is, of course, Russian official euphemistic language that’s used rather than describing more graphically exactly what’s happening. One hundred men are currently in isolation, but none are in serious or critical condition according to the army. The MD reinforced the formation’s medical staff, and provided special immunity-boosting medications. It also emphasized that all conscripts are fully supplied with essential winter clothing and footwear. The prosecutor’s inquiries include the chief of the Central MD’s medical service, the commander of the 41st Army, and the chief of the military hospital. The prosecutor’s already informed the Main Military-Medical Directorate about the unsatisfactory supply of medicines in the Yurga branch of the 321st Military Hospital. At the prosecutor’s prompting, an extra isolation ward of 130 beds has been deployed, antiviral drugs supplied, soldiers put in valenki and sheepskin coats, and outside activity cut to a minimum. According to Gazeta.ru, the South-Siberian Legal Defense Center says there are 160 to 250 men who have been ill, including several in critical condition. It says conscripts have been wearing new and inadequate Yudashkin uniforms while standing outside the brigade’s tiny mess hall three times a day in -20 (-4 F). One old lady reported her grandson was sleeping in an unheated area. 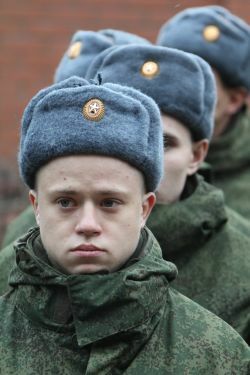 Moskovskiy komsomolets reports the military denies the outbreak of illness is related to the new uniform, and says the men still have their winter boots and valenki. One specialist who helped develop the new uniforms told the paper few soldiers have the new Yudashkin uniform, and the Defense Ministry is trying to come up with a cheaper version of it. Svpressa.ru talked at length to the legal defense center’s Yelena Lapina. She says mothers started complaining after a long oath-taking ceremony conducted outside at the end of November. It was between -15 and -20 (5 and -4 F). Parents said their sons were wearing new uniforms not suited to Siberian conditions. Rossiyskaya gazeta reports the men weren’t given proper winter gear, and didn’t have warm places to sleep. Many ended up sick, the formation’s branch hospital overflowed, and didn’t even have enough medicine. Karpenko, who had double pneumonia and kidney failure, was treated only with aspirin and paracetamol. Does this guy need lessons or what? So the boys are weaklings, should they really have been drafted? If the sickness stats are the same as last year, why is this in the news? Does he expect anyone to believe him? He does mention some chaotic reorganization as a possible factor. No one claimed 250 were in the hospital right now. He needs to be driving a tank, not talking to the media. The army said 54 guys with a pneumonia diagnosis didn’t amount to an outbreak in the formation. It did admit one needed intensive care for kidney failure in Kemerovo. The Central MD said all the men of the formation were fully outfitted in suitable new winter gear, and the new winter uniform uses better fabrics with a higher level of thermal protection than the old one. These varying accounts clearly don’t add up, but it’s hard to tell who’s lying and about what. This entry was posted in Conscription, Ground Troops, Law, Order, and Discipline, Manpower, Serdyukov's Reforms and tagged 321st Military Hospital, 41st Army, 74th Independent Motorized Rifle Brigade, Central MD, Kemerovo, Personnel, Uniforms, Yudashkin, Yurga, Yuriy Sivokhin. Bookmark the permalink. This illustrates a point that western miltary planners are missing –big time– Serdyukov has no respect for or from officers. This is an outstanding example of what a clown this minister is proving to be; the foot wrap is off, so what does that mean? Russian troops cannot fight in winter? Well, if trouble erupts they will ditch the socks, as fast as the clown minister, and grab the foot cloth, reverting to old ways. It also means the minister does not respect the military culture. Look at how fast Makarov admitted negligence on the part of the ministry. If that is what the minister is about then let the reform die fast, and let those who understand Russian military culture pick up the pieces. Cold weather, even extremely cold weather, does not cause URI’s or double pneumonia. They live in close quarters, they dont wash their hands enough, the ventilation is terrible, and this is all you need to spread germs and germs are what cause these sort of outbreaks. All it takes is one soldier arriving sick into the unit to infect 100 more. It happens in the winter because in the winter they stay indoors more than in the warmer months spreading the disease faster. If the soldiers have compromised immune systems the effect is magnified. If there is a problem with the uniforms it would manifest itself in the form of more frostbite cases and not in the form of more pneumonia. Someone in the Russian MoD needs to take Bio 101 if they think URI’s can be prevented with a better coat. I agree with Roger. If this happened in Canada we would see a number of heads role. It is hard to imagine a Russian officer at any level permitting this kind of incompetence pass through the system. If something so basic is screwed up, it is no wonder that more complex items such as the Bulava don’t work either . All quite true, but most Russians definitely believe not being properly dressed can do you in. And it is true that cold is a stress factor leaving one compromised and vulnerable to opportunistic infections. But you make a great point. One of the very few documentaries on the discovery channel showed a British doco on Stalingrad where they had a man dress up in the period German uniform, do a few fiddly tasks and get into a refrigerated truck at minus 20 degrees C for 15 or 20 minutes and then try the tasks again. They admitted the uniform looked good but the infra red camera showed enormous heat loss and the mans skills were seriously degraded by the time spent at the cold temperatures. They repeated the experiment with the same man wearing a period Soviet uniform and although he didn’t look as flash he suffered a lot less from the cold and was much better able to perform the “after” test. I hope this new design of uniform hasn’t sacrificed comfort and warmth for fit and style because at the end of the day it is the guy that can still load his rifle and shoot straight that wins the war, not the guy that looks best on the parade ground. Having said that if it really was the uniform then I would think the problems would be much more wide spread throughout the units issued with the new uniforms.